Deborah MacLatchy was formally installed Oct. 27 as the new president and vice-chancellor of Wilfrid Laurier University during the start of fall convocation ceremonies on the university’s Waterloo campus. With pomp and circumstance befitting the occasion, and following the presentation of an eagle feather and an Indigenous drum song honouring the strength of women, MacLatchy became the seventh person to serve as president and vice-chancellor of Wilfrid Laurier University since the university became a public institution in 1973. “I welcome this challenge and I look forward to working with all of you as we lead this wonderful university forward,” MacLatchy told an audience of graduands, family, friends, colleagues and well-wishers who gathered in the Lazaridis Hall auditorium. Representatives from dozens of universities across Canada joined local politicians and dignitaries in attending the event and expressing their congratulations to the new president and vice-chancellor. The installation of a president is an important milestone in the life of a university, but MacLatchy said that, for her, the convocation of students is more significant. More than 1,400 students are graduating from Laurier during fall convocation ceremonies held Oct. 27 and 28 on the Waterloo campus and Oct. 31 on the Brantford campus. In addition to MacLatchy’s installation, highlights included the conferring of two honorary degrees. The first is being presented to Cheryl Regehr, a Laurier social work graduate who has made outstanding contributions in the field of social and mental health and who currently serves as vice-president and provost at the University of Toronto. The second honorary degree is being awarded to Bonnie Brooks, a distinguished businesswoman and philanthropist who previously served as president of the Hudson’s Bay Company. MacLatchy is a distinguished scientist with extensive experience in research, teaching and senior administration. She earned an honours B.Sc. in biology from Acadia University and a PhD in zoology from the University of Manitoba. She did postdoctoral work at the University of Guelph, and began her academic career at the University of Winnipeg and the University of New Brunswick (UNB). 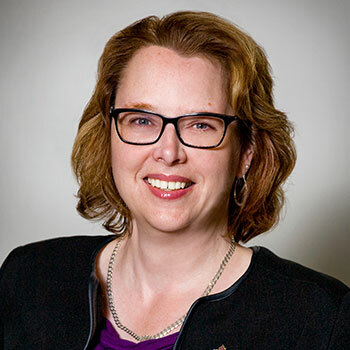 She served in a number of senior roles at UNB, including dean of Science, Applied Science and Engineering and director of the International Office. She joined Laurier in 2007 as dean of the Faculty of Science. In 2009, she was appointed provost and vice-president academic. In addition, she served as acting vice-president: research from December 2014 to November 2015. Following a rigorous presidential search process in 2016, MacLatchy was the unanimous choice of the search committee. Her appointment was recommended unanimously by the university Senate and approved unanimously by the Board of Governors in early January. She began her five-year term on July 1, 2017. MacLatchy succeeds Max Blouw, who served as president and vice-chancellor for two five-year terms.